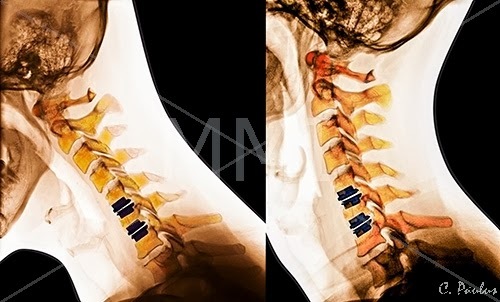 Medical Media Images is proud to showcase Color X-Ray images of Artificial Disc Replacement Devices placed in the neck. These images allow the viewer to understand the role these Devices play for patients with severe Disc Degeneration. This Color X-Ray images shows two images side-by-side. Each image represents an X-Ray of the same patient, one taken with the head bent forward, the other with the neck straightened. This patient had two Artificial Disc Replacement Devices placed at the C5/6 an C6/7 Discs in the Neck. 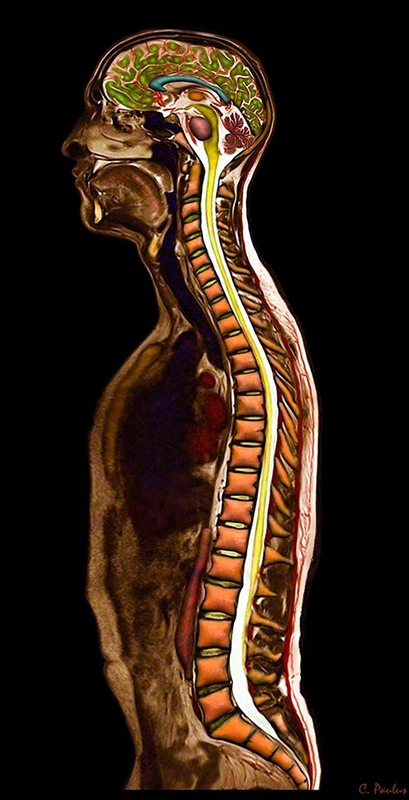 The image allows the viewer to appreciate how the Artificial Disc Replacement Devices allow the Neck to continue to move and bend, simulating the function of a normal Disc. 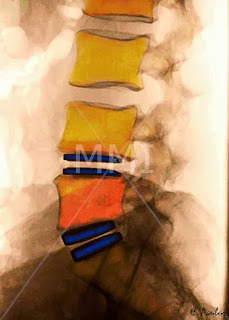 Medical Media images is proud to present Color X-Ray images featuring Artificial Disc Replacements. These images allow the viewer to clearly see Artificial Disc Replacement Devices in the Spine. This furthers understanding of the role of these devices in replacing diseased Spinal Discs. This Color X-Ray image shows a side view of two Artificial Disc Replacements implanted in the low back (lumbar spine). The Devices are shown in blue. They have replaced the two lowest Discs in the Spine at L4/5 and L5/S1. The normal curvature of the low back has been preserved. 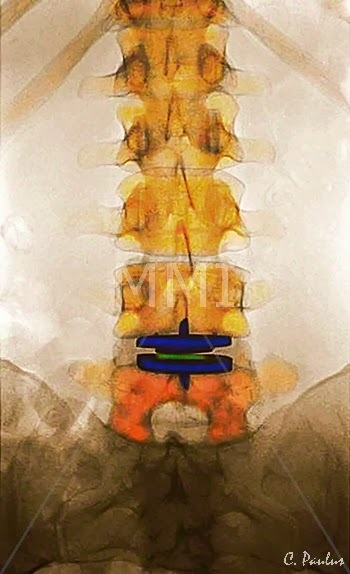 The blue components represent the metal top and bottom shells of the Device which are secured to the Vertebrae above and below the Disc. Between the two metal components, a flexible core allows this area of the spine to move, similar to a normal Disc. Medical Media Images introduces a new product. This image features Side-by-Side Color X-Ray images showing a severe Scoliosis before and after Surgery. The front view Color X-Ray on the left shows a severe Scoliosis of the mid and low back (thoraco-lumbar). The color enhances the curvature and provides a very clear and compelling view of the Scoliosis. The image on the right shows a patient who had a Fusion Surgery to correct a severe Scoliosis. 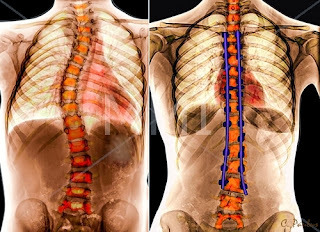 The metal rods and screws used to correct the Scoliosis are shown in blue. The image has an amazing three-dimensional effect. The fusion rods and screws seem to be hovering above the image. Overall this image shows the viewer an uncorrected scoliosis and one which has been surgically straightened. Medical Media Images is proud to announce its unique Chiropractic Images. 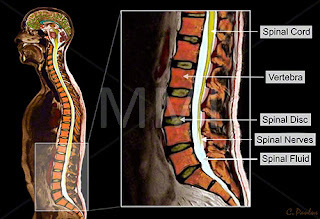 These images were specifically made to demonstrate the effect of Chiropractic Treatments on the Spine. 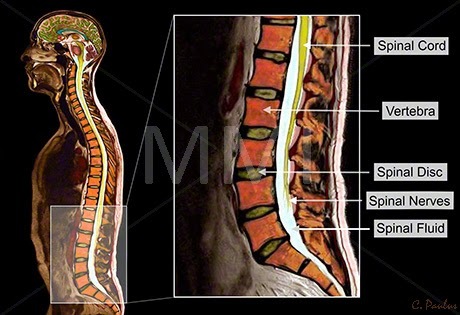 Many of these images show the spine before and after a Chiropractic Treatment. For the first time ever, Chiropractic Physicians now have a unique tool to show their patients what they do, using color MRI scans and X-Rays!! 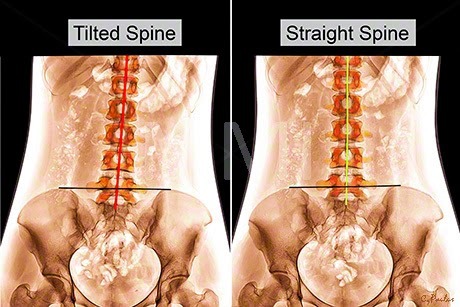 The image above displays two "Side-by-Side" front view X-Ray images which show an Abnormal, Curved spine before Chiropractic Treatment and a Normal, Straight Spine after Treatment. The red and green lines show the abnormal and normal alignment of the Vertebrae respectively. These images are ideal for Chiropractic Websites and as Office Prints for patient education and Office Art. Medical Media Images introduces its series of "Annotated Images". These images contain explanations of specific parts of an image to allow the viewer to easily see and understand the important structures. The Image above is a color MRI Image of the Lumbar Spine (low back). 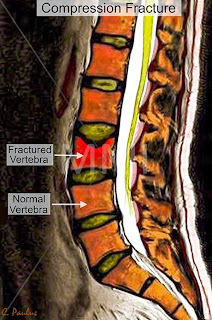 It demonstrates a Fractured (broken) Vertebra, seen in red. 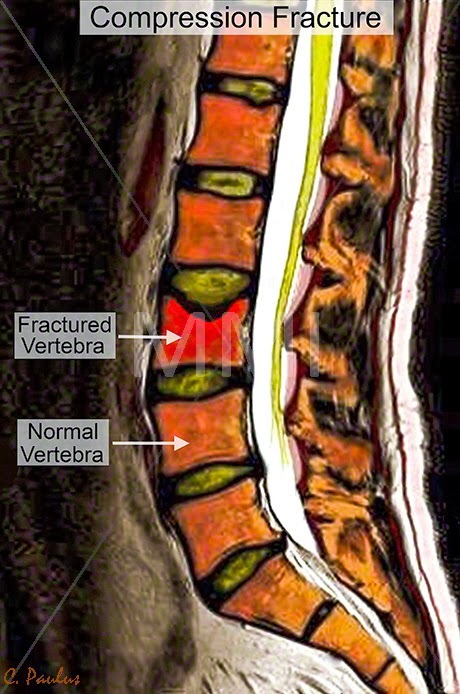 The top of the Vertebra has sunken in, which is called a "Compression Fracture". The Annotations point at the Fractured Vertebra and a Normal Vertebra below it. Annotated image such as this one can be customized by Medical Media Images. These images come to live when the viewer hovers the mouse cursor over the image. The image suddenly displays "interactive tags". These tags display text when the cursor hovers over the tag. ﻿﻿The viewer can now learn about each important part of the image. This creates a unique opportunity to learn what one can see on an X-Ray or MRI image. Patients can now understand what each structure on the Image means. Medical Media Images introduces "Side-by-Side" MRI and X-Ray images. These images are meant to show the viewer Normal vs. Abnormal Images, and Before vs. After Images. The images are also available as Interactive Images and Annotated Images. The image below is an example of a "Side-by-Side" Image. The image on the left shows a tilted Spine (low-back). The red line shows the abnormal alignment of the Vertebra. A black line is drawn across the top of the pelvis to provide a reference. The image on the right shows the Spine straightened. 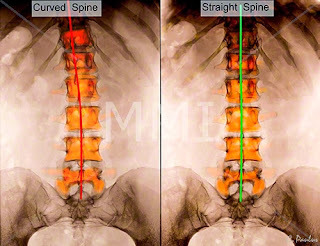 The green line shows the normal alignment of the Vertebrae. This Side-by-Side medical X-Ray image is ideal for chiropractic physicians and other spine physicians to demonstrate to their patients how a Spine can look before and after Chiropractic Adjustments. Medical Images like this one are ideal for Physician's Websites and in print for the office!! Medical Media Images is pleased to announced that the company has launched a new website (www.medicalmediaimages.com) which is designed to give those in need of medical images such as MRI scans, X-Rays or CAT scans a one-stop resource to not only obtain those images, but to get them in color. Medical Media Images, a branch of SpineWorld, is the only company that has developed an online resource for scientifically accurate color medical images. MMI is the only company worldwide which has the expertise to convert ordinary Black-and-White MRI scans, Cat Scans, and X-Rays into vibrant color and clarity. Each image is custom converted using MMI's Patent Pending Method. MMI's Chief Medical Illustrator, Dr. Christian Paulus, carefully applies unique colors to each anatomical structure. This presents the world's first anatomically correct color MRI Scans, CT Scans and X-Rays. Viewers can now finally see and understand Medical Images!! The Images are ideal for Websites and Prints.